3. Support efforts to maximise the long-term economic resilience of the New Zealand economy at the least cost. New Zealand developed an Emissions Trading Scheme as the primary tool to reduce greenhouse gas emissions. By placing a price on carbon, it helps to shift the economic burden of emissions from the government back to those who are responsible for it, and who are in a position to reduce it. A higher price for carbon stimulates clean technology and market innovation, which fuels new low-carbon drivers of economic growth. After a decade of discussions, New Zealand launched its Emissions Trading Scheme in 2008. It was designed as the primary tool to achieve emissions reduction targets under the Kyoto Protocol. International markets set the domestic price of New Zealand units, as a way to contribute to its effectiveness. New Zealand’s initial commitment to the Protocol was to stabilise net emissions at 1990 levels. However, the lack of restrictions on the types of units that could be used to satisfy New Zealand’s commitment led to trading in substandard carbon credits. In 2011, the newly elected National Government banned what it called “hot air” international carbon credits from being used within New Zealand’s scheme. As a result, New Zealand’s units are now high quality and credible, and the scheme one of the most advanced in the world. In 2012, New Zealand declined to commit to the Protocol’s second commitment period, instead deciding to set emission reduction targets independently. This meant New Zealand could no longer access Kyoto markets and, in 2015, it de-linked from the market and now operates an independent scheme. Now, global commitments to reduce gross emissions have increased materially as a result of the Paris Agreement, which took effect in 2016. The Paris Agreement’s goal is to keep worldwide temperatures from rising more than 2°C by 2100 and pursue efforts to hold the increase to 1.5°C. As of September 2018, 195 states and the European Union have signed the Agreement, representing nearly all countries in the world. The United States stated their intention to withdraw from the Agreement in 2017. Subsequently a United States Climate Alliance (USCA) formed with 16 members to date that have reaffirmed independent commitment to the country’s obligations under the Paris Agreement. The USCA currently represents approximately 40% of the America’s population and 46% of its 2016 GDP. The major early requirement of the Paris Agreement is to report Nationally Determined Contributions (NDCs) and report their progress towards these NDCs every five years. Want to know more about Emissions Trading Schemes? Need to understand how a low emissions economy works? Or just need a guide to New Zealand’s plans? You can find everything you need and more with the resources below. Read here about the idea developed by Generation Zero for a law to put New Zealand on track to zero carbon by 2050. How should New Zealand transition to a low emission economy? Watch the video above or read the full report here. 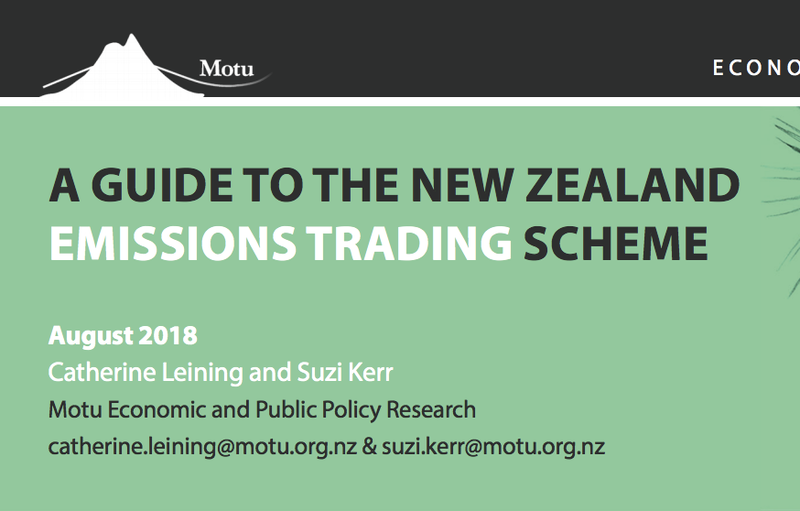 Read this guide to New Zealand’s Emissions Trading Scheme to find out how it works, and what the future might hold.